DESCRIPTION: A two bedroom end terraced cottage with further loft room in this pleasant and peaceful location close to Rusthall Common. Of particular interest to any buyer will be the improvements the owners have made to create an attractive and light open plan lounge/dining area, a pleasant, safe and enclosed rear garden and - perhaps most important of all - a private parking space to the front of the property. This is a feature that almost all terraced properties in the area do NOT have. SITUATION: The property is located in Rusthall village which has a good mix of independent retailers, a popular school and the pretty Rusthall Common. Nearby Tunbridge Wells has a far wider mix of social, retail and educational facilities including two theatres, multiple shopping opportunities at both North Farm Retail Park and the Royal Victoria Place Shopping Centre, alongside a host of independent retailers, restaurants and bars between the Pantiles and Mount Pleasant. Tunbridge Wells has two main line railway stations connecting to London termini and the south coast and there is the further availability of a commuting bus in the area (please speak to Wood & Pilcher staff for further details). Access is via a partially glazed wooden door with inset opaque glass panel. 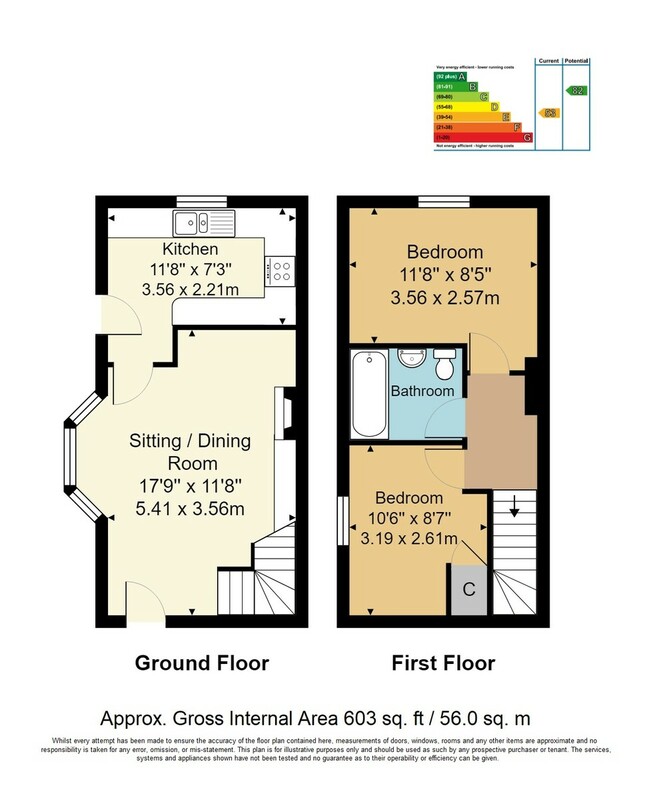 LOUNGE/DINING ROOM: A large open plan space with wood effect flooring, two radiators, stairs to first floor. Feature bay window with fitted blinds, various media points, wall mounted thermostatic control. Feature recess (formerly fireplace). Good space for sofa's, table, chairs and entertaining. Small understairs cupboard. KITCHEN: Fitted with a range of high gloss wall and base units and a complementary work surface. Spaces for freestanding fridge/freezer and washing machine. Inset one and a half bowl stainless steel sink with mixer tap over. Integrated slimline dishwasher, inset four ring gas hob with stainless steel splashback and extractor hood over, integrated electric oven. Small breakfast bar area, vinyl floor. Partially glazed double glazed door to the front with fitted blinds. BEDROOM: Carpeted. Double glazed window to the front, radiator. Door to storage cupboard. BATHROOM: Fitted with a suite comprising of panelled bath with mixer tap and single shower head attachment, pedestal wash hand basin, low level wc. Part tiled walls, vinyl floor, wall mounted radiator, extractor fan. BEDROOM: Exposed wooden flooring. Double glazed window to side with fitted blinds. REAR GARDEN: A low maintenance garden with a pathway leading from the side gate to the rear. Good areas of low maintenance paved patio with space for table, chairs and entertaining. Retaining wooden fencing, small area of lawn and further areas of raised shrub beds. Outside tap. VIEWING: By telephone appointment to Wood & Pilcher on 01892 511211.